Get the chance to dive with the fascinating Manta Rays on North Stradbroke Island with a group of likeminded happy divers. 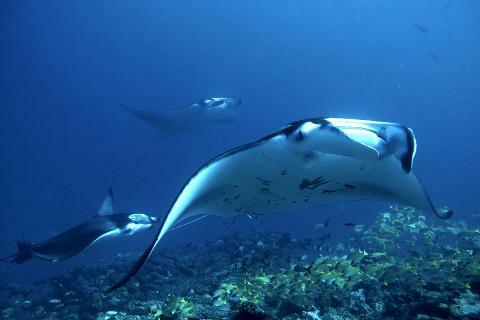 Manta Bommie cleaning station is world famous for its Mantas. As we have chartered the entire vessel, we as a group can decide to dive other sites as well around Point Lookout such as Flat Rock and Shag Rock. At night time we will cook our famous BBQ dinner which can be booked as an optional extra on the next page. We will also have an informative talk about Manta's as well as a picture show from Manta Lodge's just after dinner. This weekend is open to all levels. It is a great mix of diving and having an island gateway to relax and recharge your batteries. 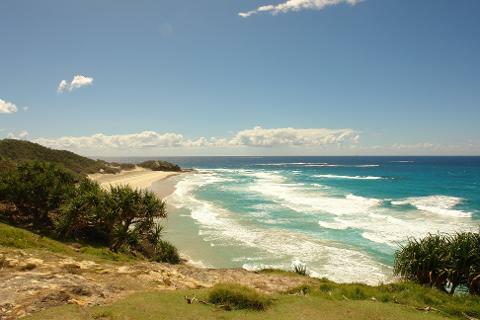 We will be taking advantage of Manta Lodge and Scuba Centre who is the only SSI and PADI dive centre on the island located right at the beach at Point Lookout. We are glad to benefit from their experience, professionalism and friendliness which ensures we have a fantastic smooth running weekend. This trip runs ex Cleveland from Saturday morning to Sunday afternoon. If you prefer, you can stay an extra night at the hostel and already arrive on Friday night. The last Water Taxi on Friday leaves Cleveland at 6:25pm. -Food other than dinner BBQ and snacks on the boat. -Hire Gear available at fair all weekend rates. Add to your booking on the next page. -Accommodation on Friday night. Add on the extras page. Please make sure you read our Terms and Conditions incl. our Cancellation Policy, which are available on the check-out page prior to completing this booking. Whilst the aim of the weekend is to dive with mantas, there is no guarantee that you will actually see a manta as the ocean is not a zoo :-). We have picked the time to be the middle of the season, which will maximise the chance of manta encounters. 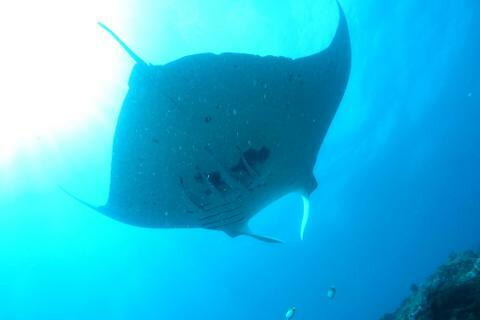 Past experiences have proven Manta Bommie to be a reliable Manta Ray diving destination. There are no refunds if no Mantas are sighted or if weather conditions do not allow diving at Manta Bommie.